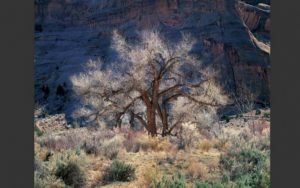 “Cottonwood & Light” is the image often published when articles about the master artist are written. It is the symbol of traditional darkroom as practiced by Ansel Adams and the transition to traditional darkroom in color by Christopher Burkett . Each photograph is a hand printed, hand crafted fine art original, solely created by the artist. As the signed & numbered originals sell the artist reviews sales and has a price increase each January. Two Camera Formats are used by the artist a Hasselblad two and a quarter size film camera and an 8 x 10 film camera a Calumet Camera..think black cloth over head looking through lens. this format is 20 x 24, 30 x 40 and 40 x 50. “Resplendent Leaves at Sunset” is a classic signature image photographed with the Hasselblad Camera in Portland’s Crystal Spring Park. No filters or digital enhancements are ever used in the artists work. Light is natural as well. The Hasselblad image works are 20 x 20, 30 x 30 and the museum size is 40 x 40. 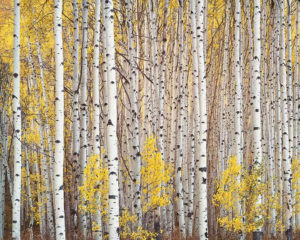 The “Aspen Grove” image is on the cover of the award winning book “Intimations of Paradise.” This image in the 40 x 50 museum size was donated to the Nelson Atkins Museum of Fine Art in Kansas City recently. The museum size works are an edition of 15 with the artist’s estate keeping number 1. The traditional photographic paper is called permanent record paper and is no longer made in Switzerland by the Illford Company . The artist has had to stockpile what is about ten years worth of paper. Some of the films he uses have also been discontinued. His work is in very few venues and is often shown with his friend and mentor Ansel Adams.